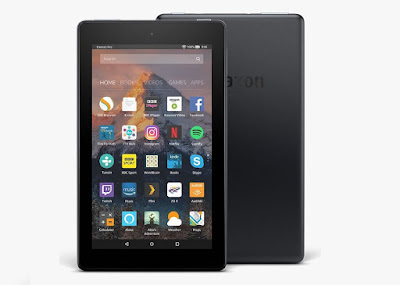 If you're considering buying a budget tablet, you might start searching for lesser known Chinese technology companies who could flog you a fairly decent slate for a pleasingly-low amount. However, the big boys are also at it these days, and none come quite so big as Amazon. We check out their own budget offering, the Fire 7. When we say budget tablet, we're usually discussing a device with lower specs and build quality, resulting in a far reduced price. We don't want to say dodgy, but often paying less for your tech - especially tech that is going to be used day in day out - means it might not last you very long. So reviewing a well-made and updated tablet from the likes of Amazon is quite refreshing - not to mention the fact that this is the cheapest tablet tablet we've ever played with. Cheap in price only, as (at time of press) the Fire 7 retails for £39.99 yet delivers a pleasurable and speedy user experience. That price might rise or lower, but the specs inside the Fire 7 should hold your attention for a good couple of years, depending on what you want it for. The unit itself is plastic fantastic, wrapped almost entirely in a velvety smooth coloured plastic back and a shiny glass seven inch screen. It is light at only 295 grams, has wake and volume rocker buttons on top, along with a headphone jack, and also a covered Micro SD card port. You can expand the storage up to 256GB, which is good, as the Fire 7 comes as standard with 8GB (or 16GB for a tenner more). Switch it on and you'll be presented by a very familiar operating system. 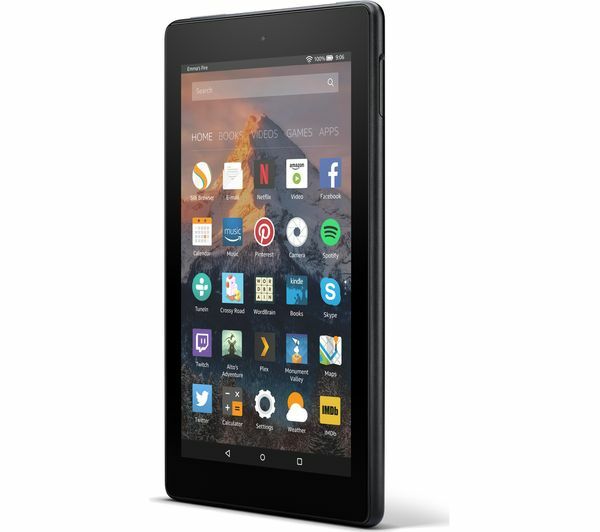 The Amazon Fire 7 runs on Android... kinda. Android is definitely there, keeping everything going, but Amazon have wrapped it up so tightly that you might not recognise it immediately. For example, the app drawer is open at all times on your home screen, while swiping to the right opens up different categories of entertainment. 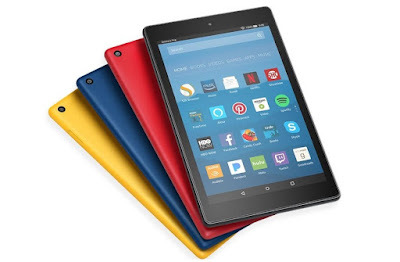 Video, music, Kindle books - as you might have imagined it is very much geared toward existing Amazon customers, and there is no access to the Google Play Store (well, there is, but you need a bit of know-how to access it). 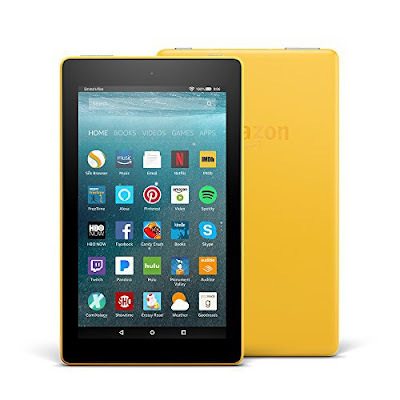 As Amazon Prime customers it was as simple job of signing in when we fired up the tablet, and then we had immediate access to our Prime Video shows, all our Kindle downloads, and also our Amazon Music Unlimited (which we reviewed here). The likes of Netflix and YouTube can also be downloaded as apps from the Amazon App Store, so it was actually very easy to go from a new product to ready to use. And that is basically what this thing is for. As a quick and easy media tablet, the Amazon Fire 7 excels. The Amazon sales page isn't forthcoming about the amount of RAM it has, but after fairly heavy use for a week or so, we're guessing at about 1GB. For streaming Netflix, surfing the web (on Amazon's own browser, which is based on Chrome), and for general and laid back app use, its great. Throw more than a few things at it at once and will begin to slow. That wasn't something we minded too much, after all, for less than forty quid you're not going to get one of these for high-powered gaming and running diagnostics. This is the kind of thing you get for a kid who wants to use it for watching TV shows and streaming music - something it does very well. Oh, and the 7 now features Alexa, which works very well at searching for media content and info from the web with your voice. Our only complaint with this is the same complaint we've always had with Fire tablets - the sales pitch. The whole device is geared towards the user shopping at Amazon, and as soon as you wake the tablet you don't see a beautiful screensaver, but rather an advert for something. Press it and you'll be taken to the sales page on Amazon. Giving that to a kid who doesn't understand what it means could be dangerous, especially if you have one-click purchasing set up on your Amazon Account. There are ways to ensure that doesn't happen, but whereas an Android tablet from the likes of Samsung would just be a tablet, ready for you to do whatever you want with it, there is still a sense of corporate over-watch with this. If you don't mind that, and if the user knows what not to press and where not to wander, you'll be fine. And come on... less than forty quid!